Eating healthy food can be more challenging than we are willing to admit. At least it is for me. I try so hard to feed myself and my family nutritious meals on a consistent basis, but some days are so overwhelming and busy that I can’t seem to get it together. On those days, we end up eating pizza. Or Chinese take-out. Doing this occasionally isn’t horrible, but it’s nice to have a recipe in your arsenal that is healthy, fast, and easily adaptable based on what you have in your pantry and refrigerator. Of course, as with any life change, consistency is important. One of the things I am always so impressed with is how much Jacqueline truly cares about helping people. She saw big changes in her own life after going sugar free and wants to help others improve their lives in a similar way. This recipe is a perfect example of how healthy eating doesn’t have to be flavorless or boring or complicated. 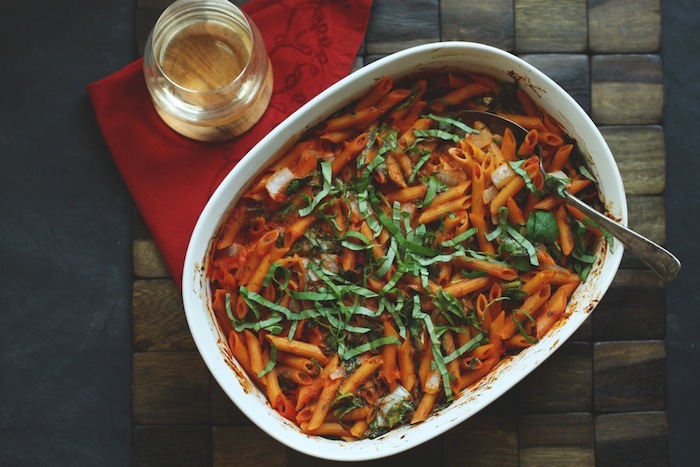 Jacqueline’s Pasta Bake is perfect for using up veggies (specifically greens) that are on their way out in your fridge. I used baby spinach, kale and fennel fronds in mine and it was wonderful. Plus, there is no need to boil water for the pasta, which makes this a one pot meal. The pasta cooks in the sauce as it bakes in the oven, which I love on those nights when I can barely find the motivation to cook, let alone do a ton of dishes. This recipe is a wonderful example of how Jacqueline is able to make healthy eating possible and enjoyable for just about anyone. If you would like to learn more about Jacqueline's Go Sugar Free online course, click here and consider registering for the summer session. About Jacqueline Jacqueline Smith, MPH is a University of Michigan School of Public Health trained health educator and motivational interviewer…and she’s a former sugar addict. She trained herself off of sugar with lasting results and will show you how to do it too. You can read more about her professional backgroundhere. When you find yourself with an abundance of greens that need to be used up because they're wilting fast, bake them into this warm, nutritious, Midwestern-feel-good pasta dish. Rest assured (for the greens-averse in your home), you'll barely taste the greens because they wilt down and the other flavors shine through. I've used dinosaur kale, spinach, collards, radish greens, and beet greens with success. This meal will make your home smell like an Italian restaurant, and its warmth and density will leave you full and satisfied. Note: my husband and I demolish this meal in one sitting between the two of us. Double the recipe if you're feeding four or more. Heat your oven to 375°F. Empty your package of dry pasta into a deep oven-safe dish. Pour a bottle of pasta sauce on top of it. Any pasta sauce will do, but vodka cream is especially conducive. Fill the sauce jar with about 1⁄2 cup of filtered water, shake, and pour over the pasta. Chop the garlic and onion. Let the garlic stand in open air for 5 minutes for maximum allicin production. Then add both onion and garlic over the pasta sauce. Sprinkle Italian seasoning over the entire dish. Add extra oregano for even more of a health kick. Stir well ensuring that all of the pasta is in contact with the sauce/water mixture. Bake for 10 minutes at 375°F. Meanwhile, finely chop your washed greens in a food processor (or with a knife). Meanwhile, chiffonade your fresh basil. When the pasta is al dente, take it out of the oven. Stir in the fresh basil, drizzle with your best finishing olive oil, and serve. Enjoy every healthy, warm bite. Notes: * From Jacqueline: Any 100% whole grain pasta will work, but after experimenting with several reasonably-priced brands, Jovial won over our household for its texture, taste, and price. All of their cuts are delicious and make for fun experimenting. I do not have any affiliation with Jovial. I'm just a fan. *From Rachael: I found the stirring the pasta halfway through the second round of cooking helped the pasta on the top cook more evenly. Full Disclosure: This post contains affiliate links. All opinions are my own.